In Part One of this nightmare scenario, the war continues to escalate out of control. Boston and New York have been devastated by nuclear weapons. 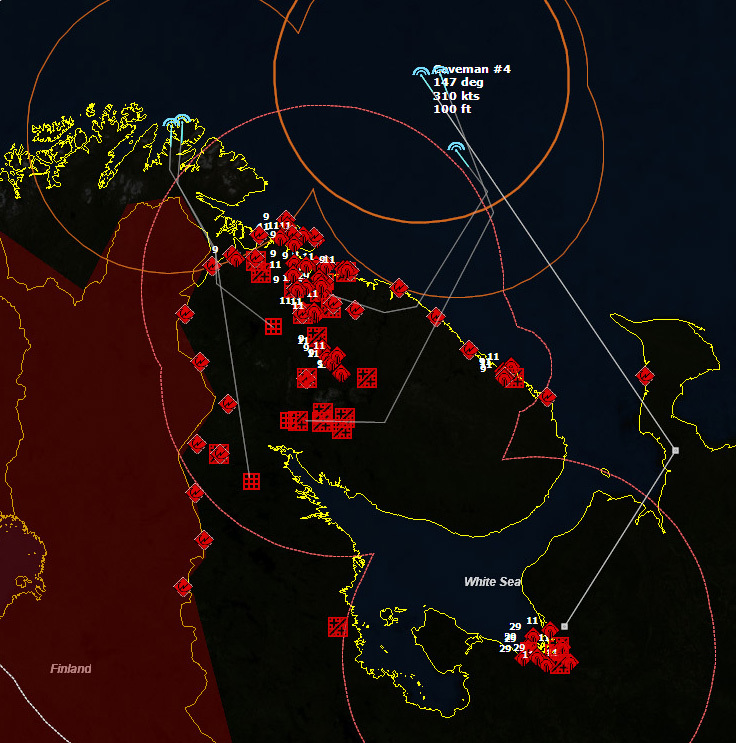 Retaliatory Strikes have been ordered by the National Military Command Center, targeting several Soviet power stations, shipyards, naval bases, and one major population center, the city of Arkhangelsk. This is disconcerting news at best. 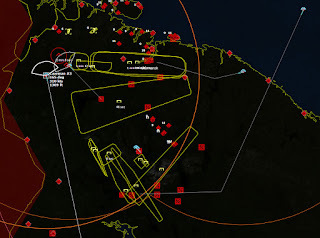 The alert B-52s move towards their targets, but then one B-52 flight is found to be non-compliant with orders. The US Air Defense fighters are ordered to seek out the non-compliant B-52s and destroy them. Two of the three non-compliant B-52s are found apparently returning to base and are reluctantly shot down, with the loss of one F-101B Voodoo interceptor that got caught in the blast of his own weapon. 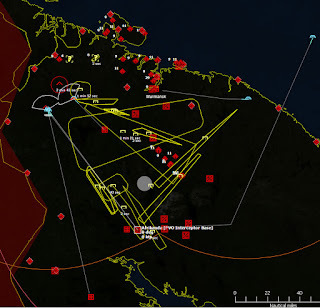 The last B-52 is apparently continuing onto his target. Whichever way he is going, I can't stop him because I have no fighters with enough fuel to reach him. 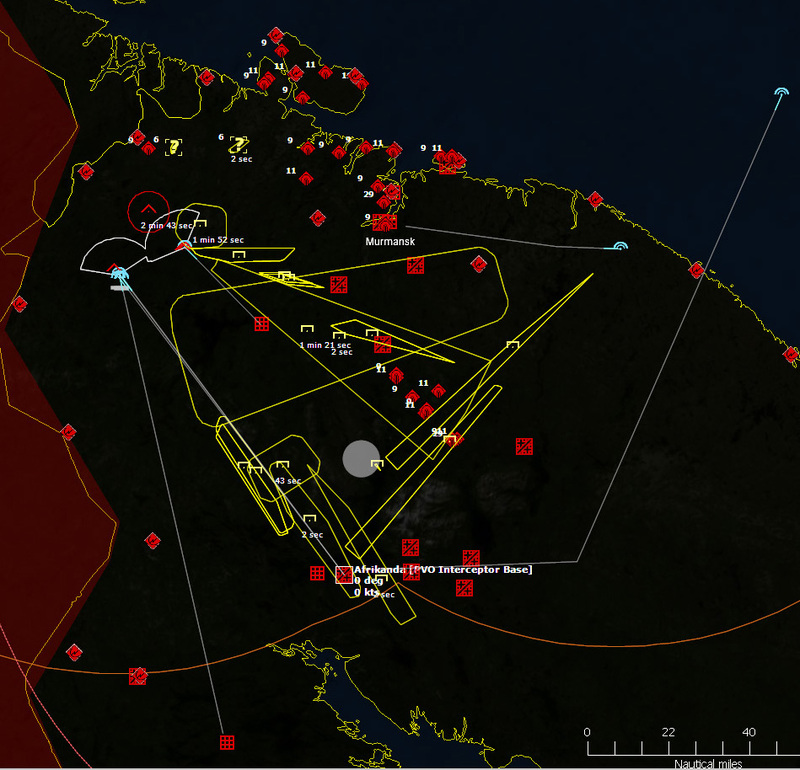 In the meantime, the remaining B-52s proceed to their targets. As the Cavemen approach the limits of Soviet Air Search Radar coverage, I drop them down to minimum altitude, a mere 100ft ASL. 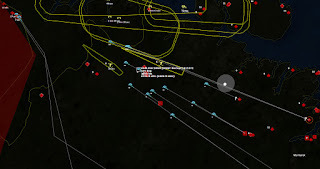 The B-52s enter Soviet Radar coverage. 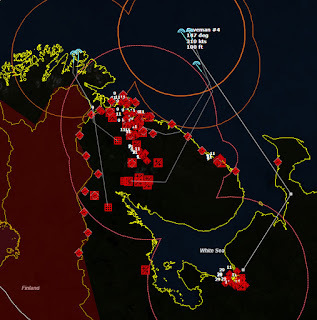 024500Z Still no response from any Soviet air defenses, although I suspect I will detect Soviet interceptors only once they begin shooting down my bombers. 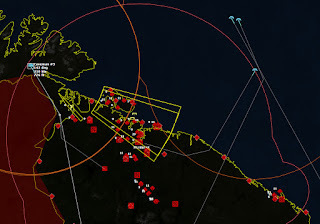 030000Z Still no visible response from the Soviet air defenses, although I see in the message log that Buff 3, the third B-52 from the non-compliant Caveman 5 flight, is hit by an AA-1a Alkali. 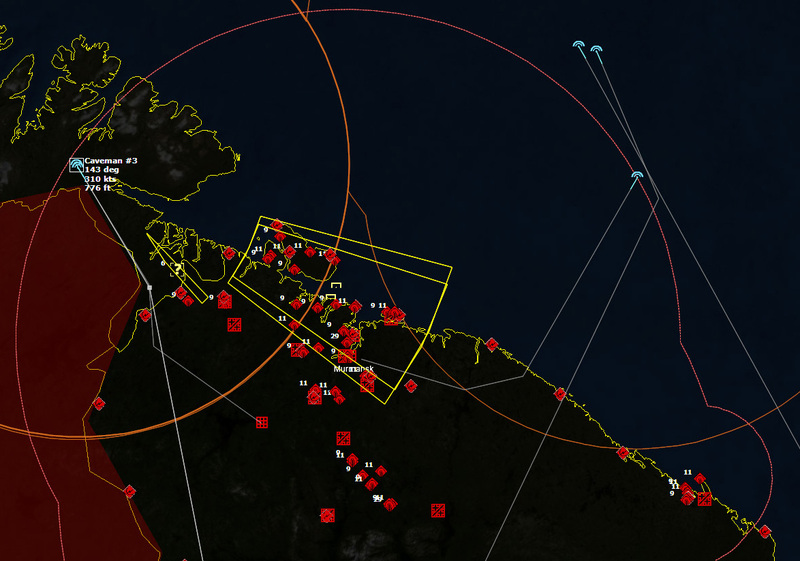 030840Z Caveman 2 and 3 go feet dry over northern Norway. 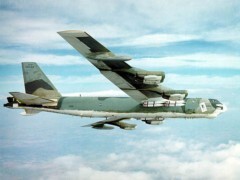 031747Z The Radar warning receivers of the B-52s light off due to Soviet aircraft. I doubt they have detected the B-52s yet, considering how low they are flying. But decision time is approaching. 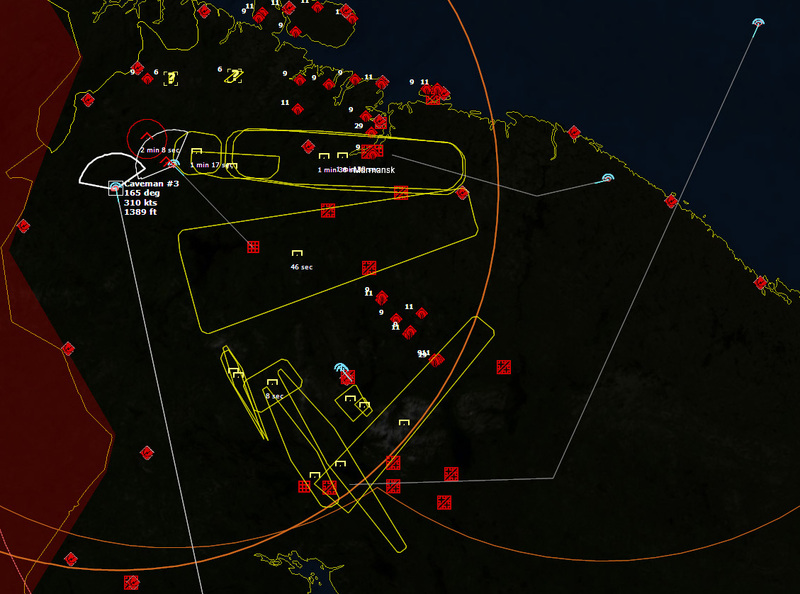 While my B-52s fly at 100ft AGL, they can get closer without being detected. However, if I am to fire my AGM-69A SRAMs to suppress SAM sites and interceptor airfields, I need to climb to 1000ft, practically guaranteeing their detection. For now I'll try to get closer before launching any SRAMs. There are now six interceptors detected, and I suspect they might be closing in. I decide to have Caveman 2 climb and launch SRAMs at a few targets. Just as I begin to get off missiles, I detect bogeys on my tail at close range. 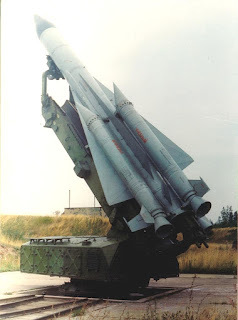 I launch SRAMs as fast as I can, but eventually the trailing bandits, identified as Su-15MF Flagon Ds, launch missiles. Fortunately the missiles miss, and the B-52s in Caveman 2 dive low again. Fifteen SRAMs are in the air. 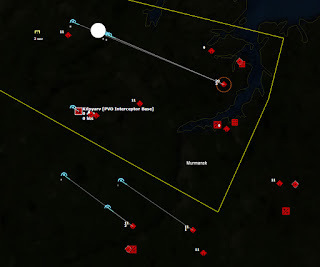 Fifteen SRAMs are in the air, aimed at seven targets: 5 at a SA-5b Gammon battalion (with nuclear SAMs), 4 at SA-2f Guideline batteries, 3 at Kilpyarv [PVO interceptor Base], 1 at Koskha Yar [Diversionary Base, Tactical], and 2 at Luostari [Helicopter / Diversionary Base]. 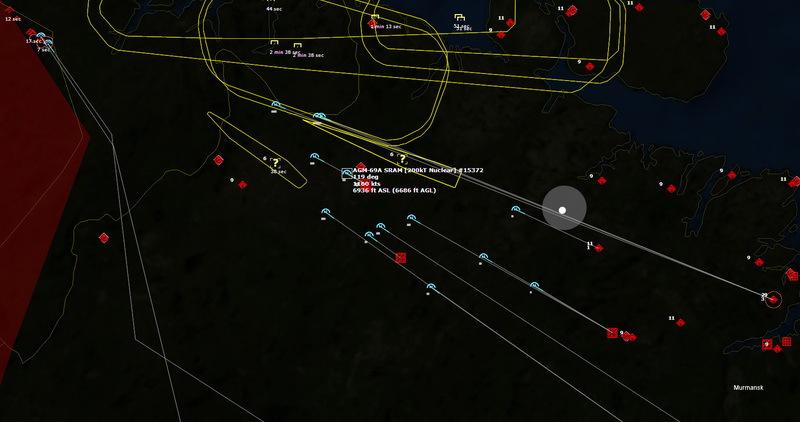 The SRAMs climb to 65000ft and accelerate to 2650kts. I doubt that much can intercept them except perhaps the nuclear SAMs of the SA-5b Gammon battalions. 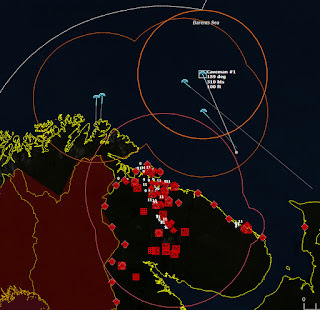 032542Z The first nuclear SAM intercepts its target, and the first nuclear fireball of the night detonates 65000 feet over the Kola Peninsula. A few seconds later, another SRAM is taken out by a nuclear SAM, very close to the first impact. The other missiles continue to close into their targets. 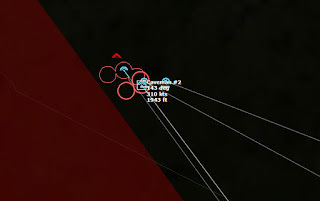 SA-3s attempt to take out diving SRAMs, but have almost no chance to hit them. 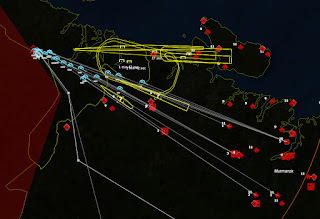 Luostari [Helicopter / Diversionary Base] is hit first, and vanishes into a nuclear fireball. At nearly the same time, one of the B-52s in Caveman 3 shoots down a pursuing Yak-28P Firebar with its tail gun. 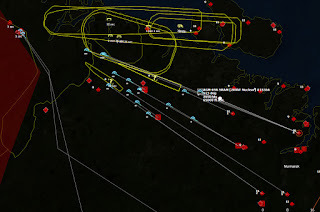 Another SRAM is destroyed, as is Luostari air field. The sole SRAM targeted on Koshka Yar misses the runway by about 3000ft, and apparently fails to detonate. The first of three SRAMs targeted on Kilpyarv [PVO Interceptor Base] misses by a similar amount and also fails to detonate. The second SRAM targeted on Kilpyarv is shot down by an SA-3b Goa less than a mile from the base in a one-in-a-million shot (well, one in a hundred, anyway). A second Firebar is shot down by the B-52s in Caveman 3. 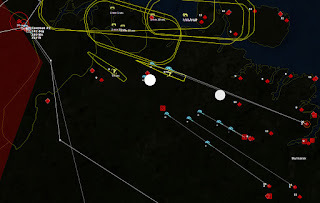 As the three remaining SRAMs targeted on the SA-5b Gammon nuclear SAM site close in, one 25kT Nuclear SAM misses, detonating harmlessly, while another malfunctions. The last SRAMs close in on their targets. The third (and final) SRAM targetted on Kilpyarv misses by half a mile...and fails to detonate. One of the SRAMs targeted at a SA-2f Guideline battery hits its target. More nuclear SAMs are launched, and manage to take out the three remaining SRAMs targeted on the SA-5 battalions. At the very least, they've reduced the nuclear SAM magazines somewhat. Another Firebar is shot down, and seconds later the last SRAM detonates and destroys a SA-2 site. 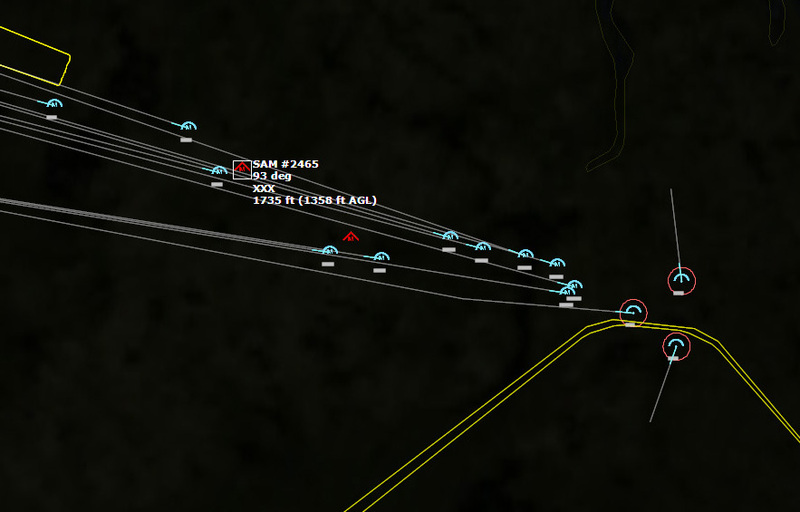 032849Z Caveman 2 climbs again and launches six more SRAMs, and a Firebar launches more missiles at them. In the meantime, the B-52s from Caveman 3 shoot down yet another Firebar, and again, fortunately, the Firebar's missile misses its target. A nuclear SAM misses an SRAM, detonating behind it, but another nuclear SAM takes out the one SRAM targeting the SAM battalions. One of the SRAMs scores a hit on Koshka Yar, destroying it. Four SRAMs are left, two targeting Kilpyarv, which has been launching every fighter available, and one each targeting SA-2 SAM sites. Finally, after another SRAM misses Kilpyarv far enough that it doesn't detonate, the last SRAM targeted against it hits (well, misses by only 1550ft), which is enough to detonate and destroy the air base. Three more Firebars are shot down. The fact that the Soviet interceptors cannot engage the B-52s when they are flying this low is what's keeping them alive. An Su-15 Flagon and an Su-9B Fishpot are shot down. The tailgunners are truly raking in the kills. 033621Z Caveman 2 is 33nm from its target, the Upper Tuloma Hydro-Electric Power Station. The flight briefly popped up to launch two SRAMs at Monchegorsk [PVO Interceptor Base], which had recently launched multiple fighters. The first SRAM hits and Monchegorsk is destroyed. Caveman 3 climbs to launch altitude to fire three SRAMs at Afrikanda [PVO Interceptor Base], before diving down low again. 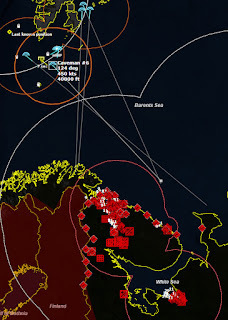 Three more Flagons are shot down. 033837Z Caveman 6 launches a massive salvo of SRAMs against SAM sites around Severomorsk and Polyarnyi. I detect a SAM headed for Caveman 6. I had hoped that the SA-5 nuclear SAM batteries would be distracted by all the SRAMs I'm throwing at them, but apparently they managed to send one at the B-52s. I immediate split the flight of three into individual planes and have them scatter and dive. Hopefully I won't lose them all. The B-52s scatter as the SAMs close in. I lose contact with one of the SAMs, but the other two close in. 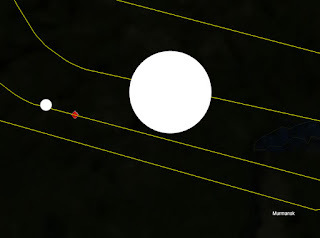 My B-52s are two miles apart and continue to separate, hopefully they will have separation enough to survive. The tactic works. All three B-52s manage to survive. Meanwhile, the SRAMs close in relentlessly. 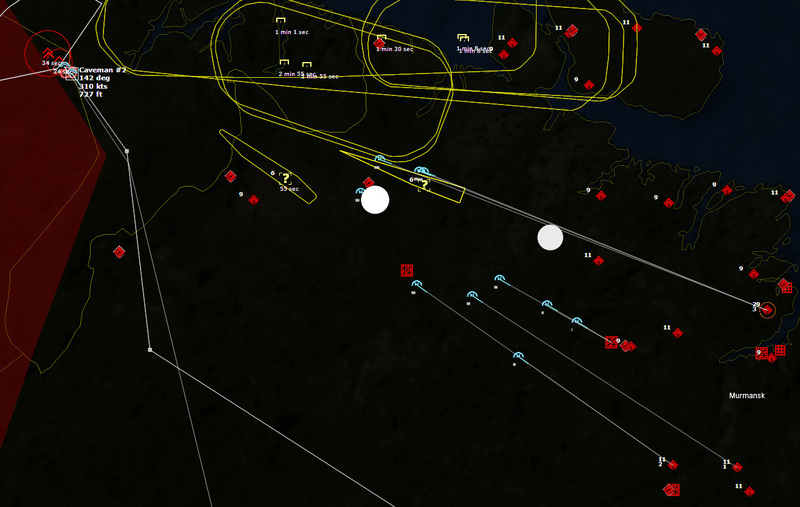 The B-52s survive and the SRAMs appear to be about to overwhelm their targets. 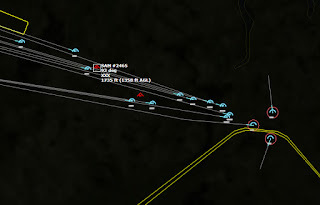 The SA-3 battery next to Severomorsk is hit by the first SRAM, despite desperate salvos of SA-3s to bring it down. Four more are inbound to that target. 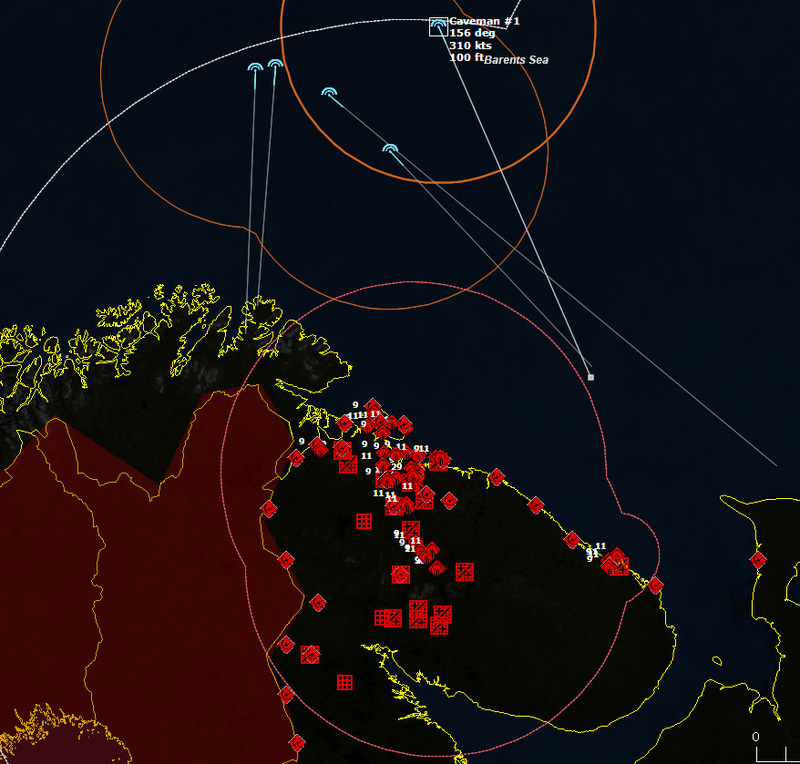 Multiple nuclear SAMs destroy inbound SRAMs, but also Severomorsk is destroyed in the 200kT nuclear fireball. The SRAM that hit the SA-3 site next to Severomorsk, being a 200kT weapon, is sufficient to completely destroy Severomorsk. The B-52 go after their secondary target of Polyarnyi instead. 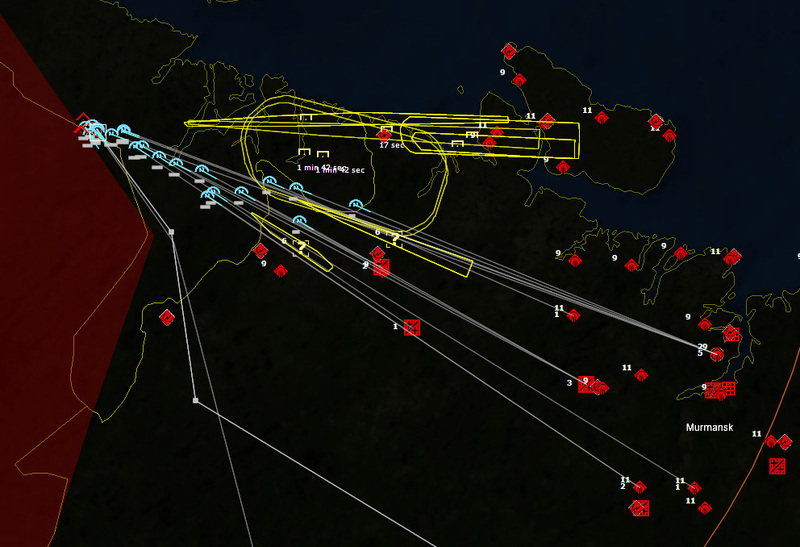 To the south, the SRAMs impact Afrikanda [PVO Interceptor Base], wiping it out. 034050Z The last SRAMs launched by Caveman 6 impact, wiping out multiple SAMs site. The area around Murmansk and Severomorsk is swamped by mushroom clouds and burning buildings and trees. The way is clear for Caveman 6 to move in and bomb Polyarny. 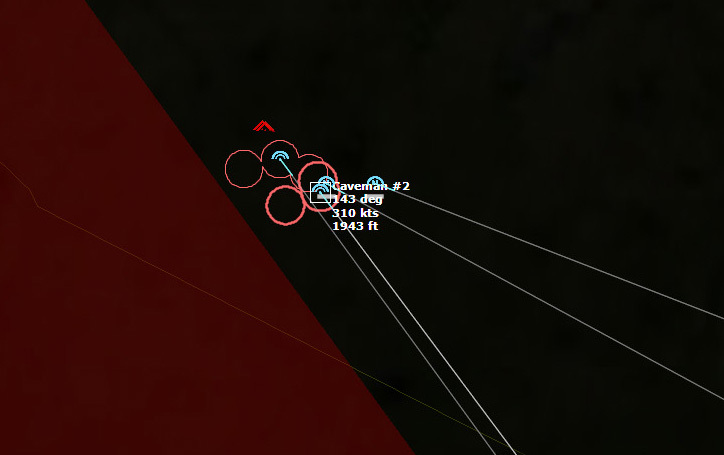 Meanwhile, Caveman 2 has closed to within 10nm of its target, Upper Tuloma Hydro-electric Power Plant. 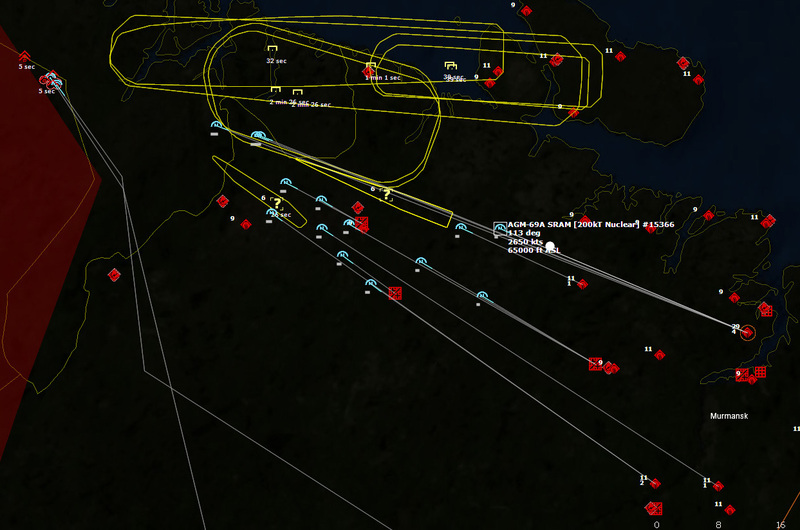 I do have to say that despite this being "just a simulation," this scenario was "disconcerting" to play.